After a few distractions (like doing some actual paying work), I managed to get some work done on the kōzu pattern for the book. 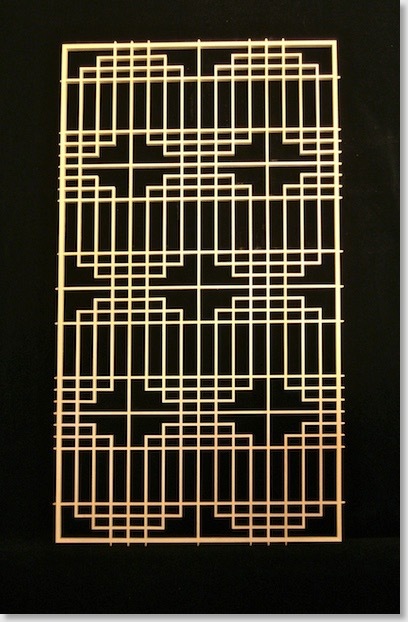 The photo shows one of the completed kōzu sections of the panel. The multiple layers of the crosses to me really highlights the beauty of this pattern. 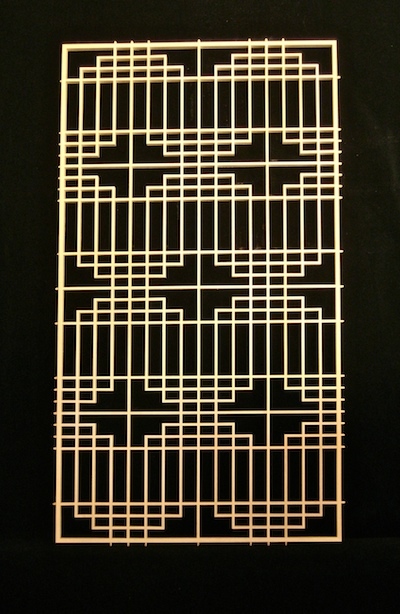 I would have preferred a greater interval between the rows of crosses, and in principle, this interval should be at least the same size as the crosses, but because I designed this purely for instructional purposes, and I also wanted the multiple cross layers, and to include the futae-shokkō pattern at the bottom, I had to bring them a little closer than I would have liked. Because there is a clear differentiation between the crosses, though, this is a reasonably satisfactory design. While there is a little design flexibility with the kōzu pattern, there are some design and dimensional principles that should be adhered to, and I cover these in detail in the book. And although I don’t make the other kōzu patterns, I also give diagrammatic examples of the hitoe-kōzu, mie-kōzu, and another way of making the futae-kōzu involving slightly simpler cuts but more kumiko. For shoji made with this pattern to be anywhere near economically feasible, the work processes have to be streamlined. That means that when making the cuts, the same cut should not be repeated (unless, of course, there are too many kumiko to be manageable for a single cut by hand). Repeating the same cut simply means that additional time has been spent and wasted lining up, securing and cutting the kumiko. What I mean by this is that, say, when making a joint cut in the vertical kumiko to fit a horizontal kumiko, all the vertical kumiko that require that joint in the same position to house that horizontal kumiko should be cut at the same time. This also applies when making the cuts in the horizontal kumiko for the vertical kumiko. In the book I detail the optimum cutting sequence for both vertical and horizontal kumiko.This pattern is time-consuming, but it should not take a long time. This pattern may seem simpler than the futae kaku-tsunagi I introduced in Book 1 and show here, but the cuts and assembly are, in my opinion, more complex. I also detail a suggested assembly sequence (the one I use) to help the process for the kōzu pattern flow more smoothly. It’s now on to completing the shoji, finishing the writing part, then designing the next shoji, which will be a step up from the naka-nuki shoji shown here.